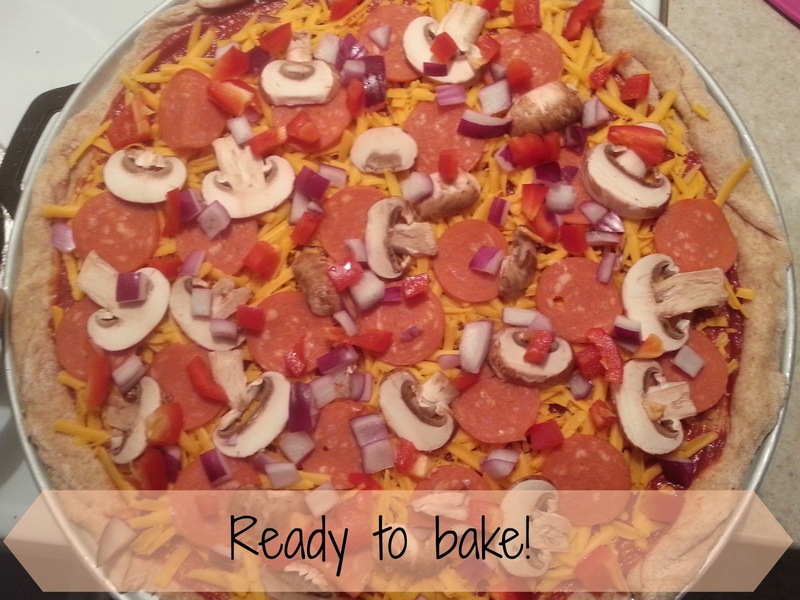 We LOVE homemade pizza, and I especially love it because it is so easy to make, and there is so much variety to be had! When I first started making pizza dough, it was classic fluffy white dough. 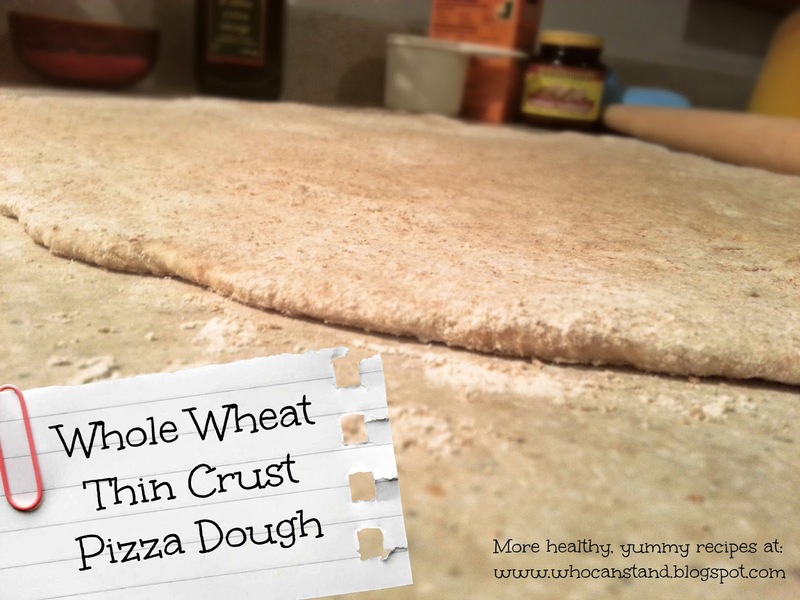 Andrew much prefers it thin crust, and since we had been switching over to using whole wheat flour more regularly, it evolved into this crust, which we really prefer! If you love white and fluffy, this might not be the dough for you! It's really a pretty basic recipe, and the original one came from the little cookbook that came with my Kitchenaid (a wedding present!). I make it in the mixer, which makes it really easy, but I'm sure you could do it by hand too. *I used to take the temperature of the water, but now I know to use our tap's hottest setting. It is just above being too hot to keep your hand in. Warm up the bowl by swishing around some warm water in it. Add 1 cup warm water. 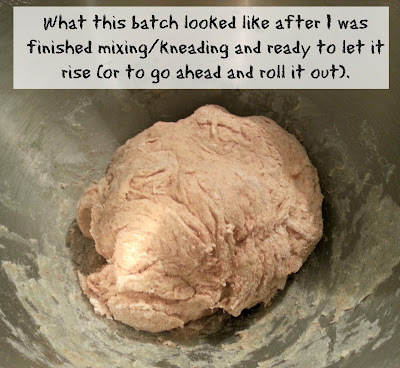 Immediately add 1-2tsp of yeast, depending on how much you'd like your crust to rise. Give it a little stir, and add 1/2 tsp oil and 2 tsp olive oil. Add 2 1/2 cups of whole wheat flour, and mix for about one minute on low speed. Gradually add the remaining flour, 1/2 cup at a time. This is where you gotta get a little touchy-feely with the dough. Using whole wheat flour I rarely add the whole 3 1/2 cups of flour, or if I do I end up adding water later. You don't want your dough to be sticky, but like a nice lump. It should stick to the kneading hook of the mixer, but sometimes if it isn't I just grab it off and finish kneading it together by hand. Now you can put it back in the bowl, cover it with a tea towel, and let it rise for up to an hour, or you can make it right away! I roll mine out using a pin, which makes it really easy. Sprinkle some flour or cornmeal on the pan before you transfer it, to prevent it from sticking. After you have added sauce and toppings, bake for 15-20 minutes at 425F.